Bruno Soriano went back to his former school to visit the kids from Artana. Artana enjoyed the most emotional edition of the ‘A Star in Your School’ initiative. 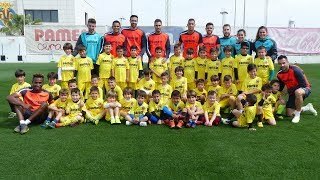 Villarreal CF captain, Bruno Soriano, relived countless memories from his childhood by going back to his school, CEIP Carme Martín, as a part of the ‘Endavant Club Groguet’ (Yellow Kids Club) project. The Yellow number 21 shared some beautiful moments and funny stories with the students, who got to enjoy spending time with their idol up close, as well as getting their photos taken with him and his autograph too. A memory they will never forget. And one that the Yellow Submarine captain won’t forget either, as he went back to the school he once attended. With this being the case, the school itself did not want to miss out on the opportunity to appreciate their most illustrious former pupil. 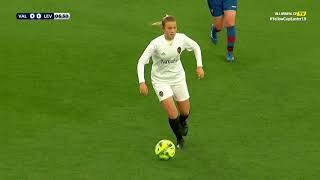 Thus, they asked the captain’s very own mother to surprise him by presenting him with a personalized ball with his name, shirt number and the badges of CEIP Carme Martín, Artana CF and Villarreal CF prinited on it. 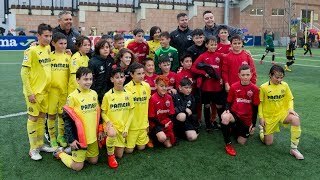 The surprise really touched the Yellows’ centre midfielder, who thanked the school for the gift and in turn gave the school two of his official Villarreal shirts. The visit, which took place in the school’s sports hall, concluded with an emotional poem recited by the pupils from Carme Martín. After the event, Bruno went to every class to say hello to the youngsters that study and play where the Villarreal captain first learnt to kick a ball. This is the tenth edition of this season’s ‘A Star in Your School’ initiative. Andrés and Mario visited the CEIP Carles Selma school, Trigueros and Barbosa went to the Pío XII school in Vila-real, Santos Borré and Rukavina to the Colegio Felicinda Collell in Càlig, Trigueros and Rodrigo to the Colegio San Agustín in Castellón, Bakambu and Jonathan paid a visit to the Nuestra Señora de la Consolación school in Burriana, Bonera and Álvaro visited the Agora Lledó International School in Castellón, Jaume Costa and José Ángel took the Fundación Flors school on a tour of the Estadio de la Cerámica, Bruno visited the CEIP Josep Iturbi school in Burriana and, in the previous edition, Adrián attended the Colegio Nou Pedro Alcázar school in Nules. 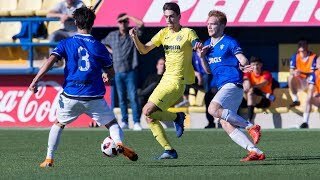 Along with the interview with the Villarreal stars, the schools in the Castellón province can also enjoy a visit from some of the Yellows Academy coaches, as well as a guided tour of the Estadio de la Cerámica, all free of charge. To see the best photos from Bruno Soriano’s visit to the CEIP Carme Martín school just click on the 'Gallery' tab above.